Heather Fell failed to overturn a 19-second deficit in the 3,000m run of the modern pentathlon but the Briton won silver behind German Lena Schoneborn. Fell began the final of the five events in second place and held off Ukraine's Victoria Tereshuk who finished third. Schoneborn, the world number three, led the competition after dominating the epee fencing, winning 28 of 35 bouts. unassailable advantage for the run. Fell shot 185 in the the 10m pistol and won 20 of her 35 fencing bouts to surge up the leaderboard before producing her best 200m swim of the season to move into second place. And in the show jumping, she had two fences down to keep her in touch with Schoneborn, but could only make up 10 seconds to finish with 5742 points. Fellow Brit Katy Livingston, who started the run one minute behind the leader, moved up from ninth to finish seventh on 5548. Fell's silver continues a great run in the modern pentathlon for Britain's women following its introduction as an Olympic sport in 2000. Steph Cook and Kate Allenby won gold and bronze respectively in the inaugural competition in Sydney, while Georgina Harland's won bronze four years ago in Athens. And she had a message for the trio after finishing the race. "Thanks for the inspiration," Fell said on BBC Sport. 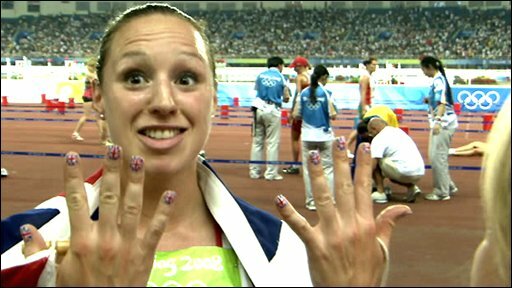 "I had some luck - you have to for five events to go so well. "And we had quite something to live up to, but both of us finishing in the top seven in our first Olympics is brilliant and shows what a strong team we have." Fell also thanked the support of the British fans throughout the day-long event. She added: "I was loving the GB supporters, they helped me so much and made it a brilliant day." Livingston blamed a below-par fencing display for her failure to win a medal. It might be worth asking if the (not very) modern pentathlon is still worth its place in today's Games. She said: "My shooting was better than normal, but my fencing was average and made the difference between a podium and seventh. "I can't complain though - the other four events went well and I had a personal best in the swim." Reigning world champion and world number one, France's Amelie Caze, had her medal hopes derailed when she had four fences down in the show jumping.